OK, it might not be that extreme, but I have recently been trying out a new desk configuration. Being a software developer, the majority of my working time is spent in front of a computer. To be honest, since it’s something I enjoy learning about and doing (not just because I “have to” for work), a decent chunk of my leisure / hobby time involves computer use of some sort as well. This brings us to ergonomics. Regardless of how much time you’re going to use your computer, it’s in your best interest to take care of your body while doing so – specifically avoiding the long-term damage that can come simply from neglecting things like good posture. 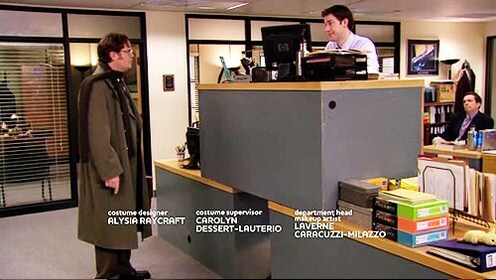 Recently a few social networking posts got me thinking again about a concept I’d read about before: the standing desk (as seen on the left in the above image). You can do your own web searching for all the info on the benefits of standing rather than sitting down all day. Long story short, I thought it was interesting enough to check out. The huge downside that has deterred me from exploring this further before is that a lot of the recommendations involve either buying a standing-only desk (replacement) or a convertible contraption capable of supporting both standing and sitting. While there are some cheap, DYI options (at least for the standing-only variety), some of these things can get really pricey. Inspiration struck me when I noticed that a dresser already situated right next to my desk just happens to be the perfect height for me to very quickly achieve the position shown in the left image above – merely by moving my keyboard and mouse up to the dresser surface, and setting the monitor atop a platform raised to the appropriate height. For the last couple weeks I’ve been trying out this setup – alternating between sitting and standing for either one or two Pomodoros at a time, and I’ve found it to be a refreshing change. I think I feel more focused during the standing sessions, and while I think it might be a bit too much to fully switch over to it, I may try to gradually adjust the balance away from 50/50, in favor of standing. One other thing it’s great for – sometimes prior to working or during breaks I’ll exercise. Yeah, again, not as much as I should / plan to, but I’m getting better. Anyway… the point is that after doing so, standing is a good alternative to covering my chair with a towel to avoid getting it sweaty. In summary, I recommend giving some variation of the standing desk a try. 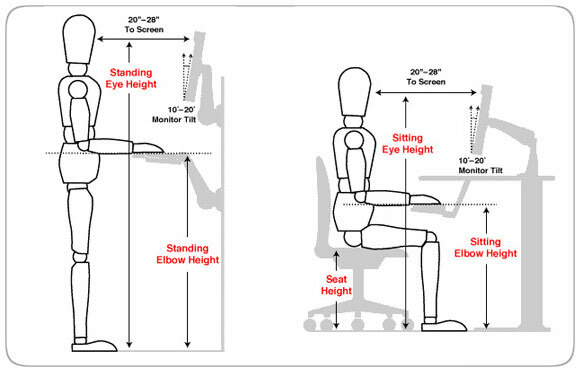 Even if you don’t though, take note of the posture image above whether you’re sitting or standing. It may seem complex at first glance, but really it’s just a few straight lines and 90 degree angles. Your body will thank you later.